5' split post. Also available in 5'6″ and 6', used for stockproof and electric fencing. Bale of 90, 5' split post. Also available in 5'6″ and 6', used for stockproof and electric fencing. 5'6″ split post. Also available in 5' and 6', used for stockproof and electric fencing. Bale of 90, 5'6″ split post. Also available in 5' and 6', used for stockproof and electric fencing. 5' full round 2-3″ post. They are ideal for electric fencing, temporary fencing or even as tree stakes. Bale of 80 number, 5' full round 2-3″ posts. They are ideal for electric fencing, temporary fencing or even as tree stakes. 5'6″ full round 3-4″ posts, our rounds stakes and strainers are available in multitude of lengths and widths and have a variety of uses. They are ideal for electric fencing, stock proof fencing, sheep & bull wire fencing or even as tree stakes. 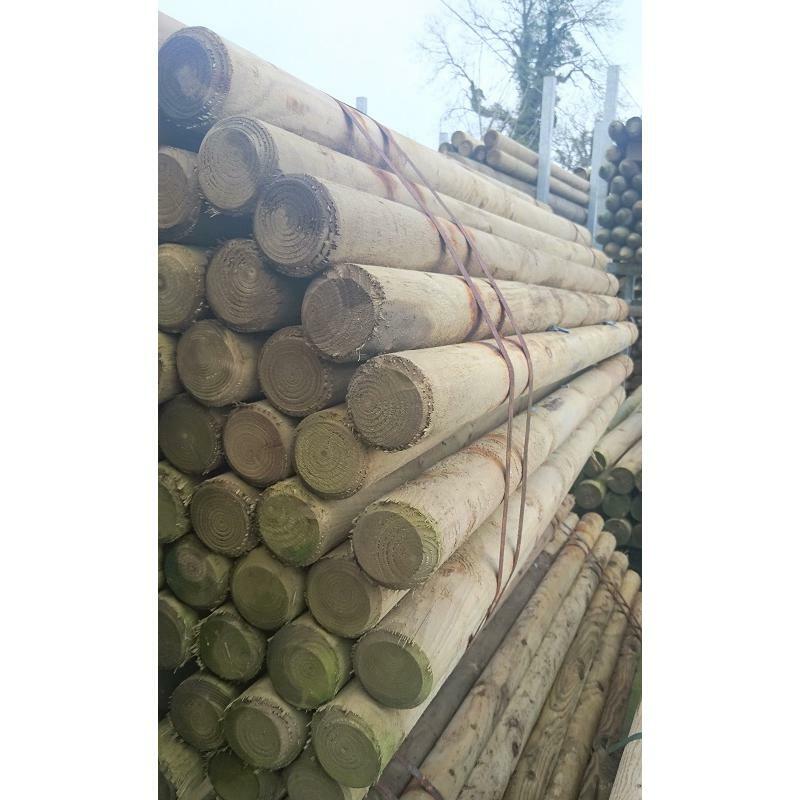 Bale of 90 number 5'6″ full round 3-4″ posts, our round posts and strainers are available in multitude of lengths and widths and have a variety of uses. They are ideal for electric fencing, stock proof fencing, sheep & bull wire fencing or even as tree stakes. 5' full round 4-5″ posts, NSAI certified kiln dried and treated, Grant and TAMS approved with 15 year warranty. Bale of 60 number 5' full round 4-5″ posts, NSAI certified kiln dried and treated, Grant and TAMS approved with 15 year warranty. 6' split post. Also available in 5'6″ and 5', used for stockproof and electric fencing. Bale of 90, 6' split post. Also available in 5'6″ and 6', used for stockproof and electric fencing. Bale of 60 number 6' full round 4-5″ posts, NSAI certified kiln dried and treated, Grant and TAMS approved with 15 year warranty. 6' full round 3-4″ posts, our rounds stakes and strainers are available in multitude of lengths and widths and have a variety of uses. They are ideal for electric fencing, stock proof fencing, sheep & bull wire fencing or even as tree stakes. 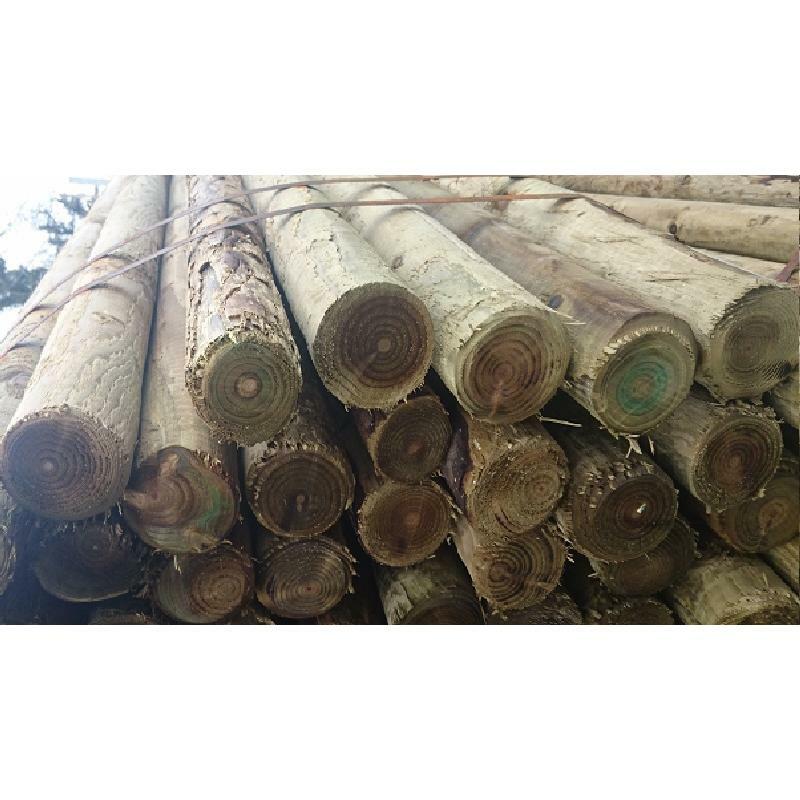 Bale of 70 6' full round 3-4″ posts, our round posts and strainers are available in multitude of lengths and widths and have a variety of uses. They are ideal for electric fencing, stock proof fencing, sheep & bull wire fencing or even as tree stakes. 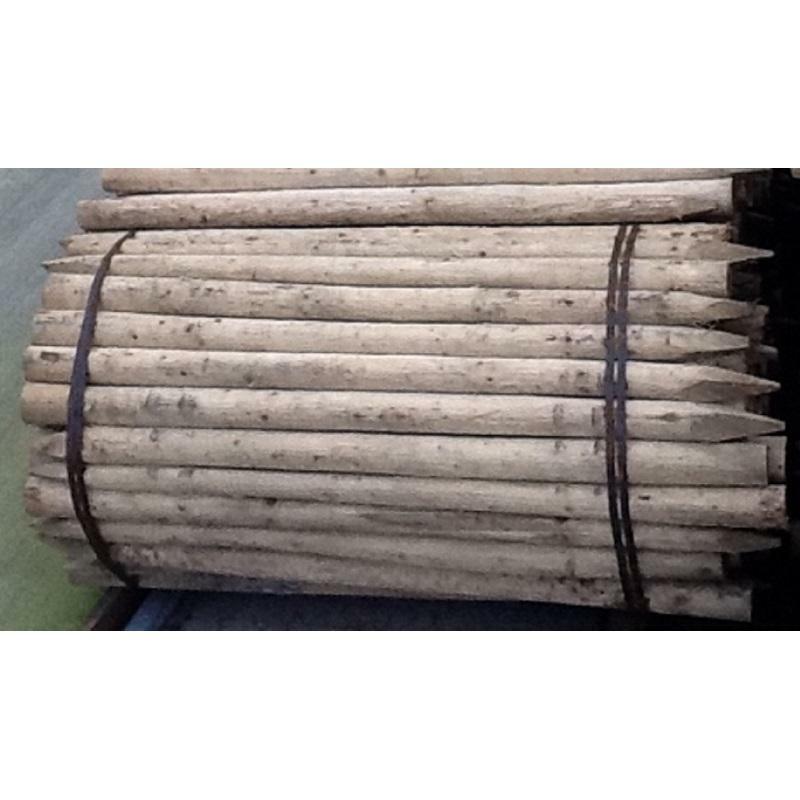 6' full round 4-5″ posts, our rounds stakes and strainers are available in multitude of lengths and widths and have a variety of uses. They are ideal for permanent stock proof fencing. Bale of 60- 6' full round 4-5″ posts, our rounds stakes and strainers are available in multitude of lengths and widths and have a variety of uses. They are ideal for permanent stock proof fencing. 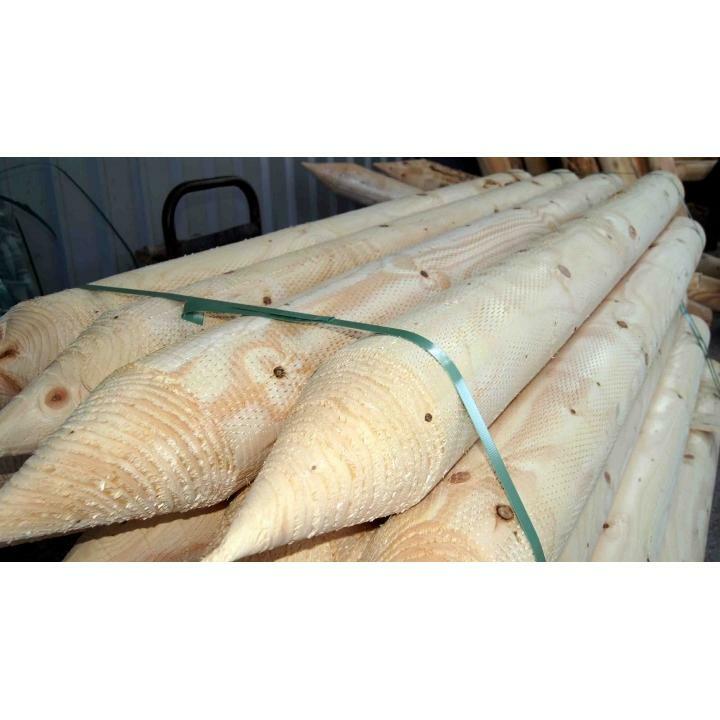 6' full round 3-4″ posts, NSAI certified kiln dried and treated. Our round stakes and strainers are available in multitude of lengths and widths and have a variety of uses. They have a warranty of 15 years and are ideal for electric fencing, stock proof fencing, sheep & bull wire fencing or even as tree stakes. 6' full round 4-5″ posts, NSAI certified kiln dried and treated, Grant and TAMS approved with 15 year warranty. 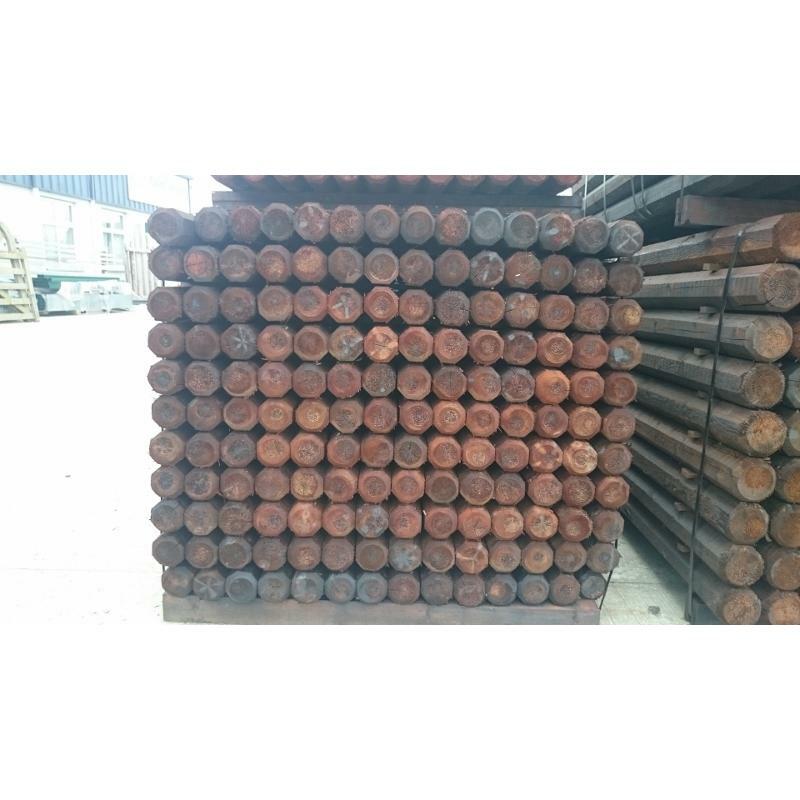 1.6m (5'6″) long 75mm (3″) diameter machine fencing posts. Pointed – ideal for driving. Pressure treated. 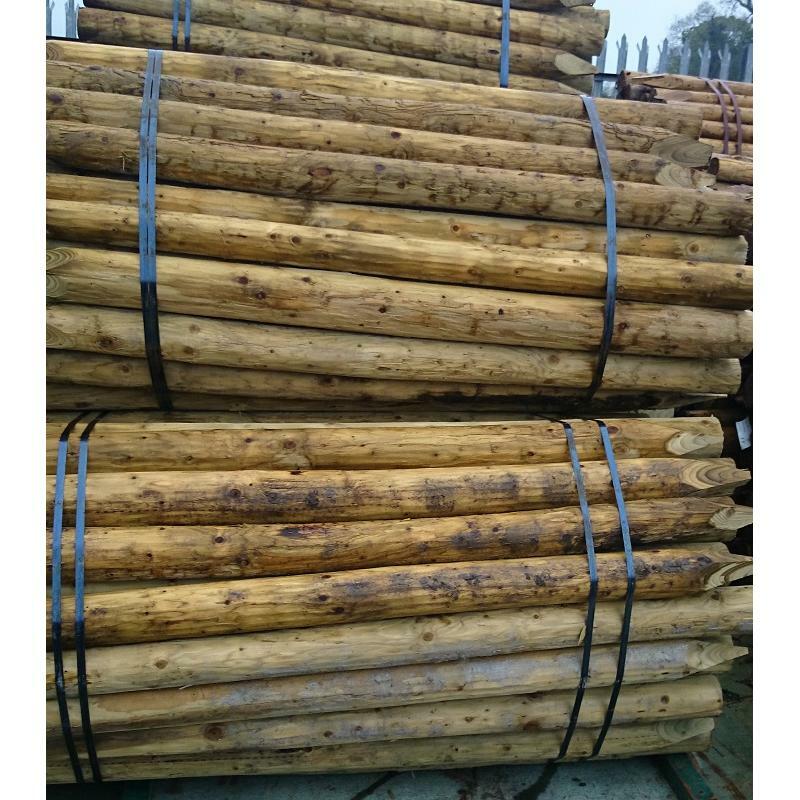 1.6m (5'6″) long 100mm (4″) diameter machine fencing posts. Pointed – ideal for driving. Pressure treated. 1.8m (6') long 50mm (2″) diameter machine fencing posts. Pointed and pressure treated – ideal for using as stakes for young trees. 1.8m (6') long 75mm (3″) diameter machine fencing posts. Pointed and pressure treated – ideal for driving. Used for sheep, barb wire or temporary fences. 1.8m (6') long 75mm (3″) diameter 2nd's machine fencing posts. Pointed and pressure treated – ideal for driving. Used for sheep, barb wire, electric or temporary fences. Bale with 150 of 1.8m (6') long 75mm (3″) diameter machine fencing posts. Pointed and pressure treated – ideal for driving. Used for sheep, barb wire or temporary fences. Bale with 150 of 1.8m (6') long 75mm (3″) diameter 2nd's machine fencing posts. Pointed and pressure treated – ideal for driving. Used for sheep, barb wire, electric or temporary fences. 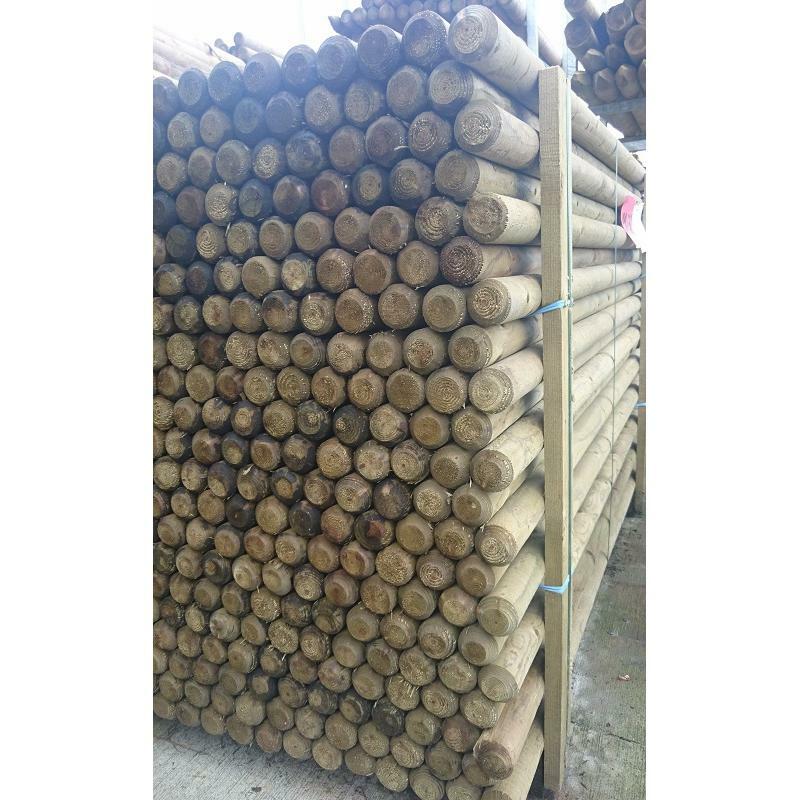 1.8m (6') long 100mm (4″) diameter machine fencing posts. Pointed and pressure treated – ideal for driving. Used in permanent stockproof & roadside fences. 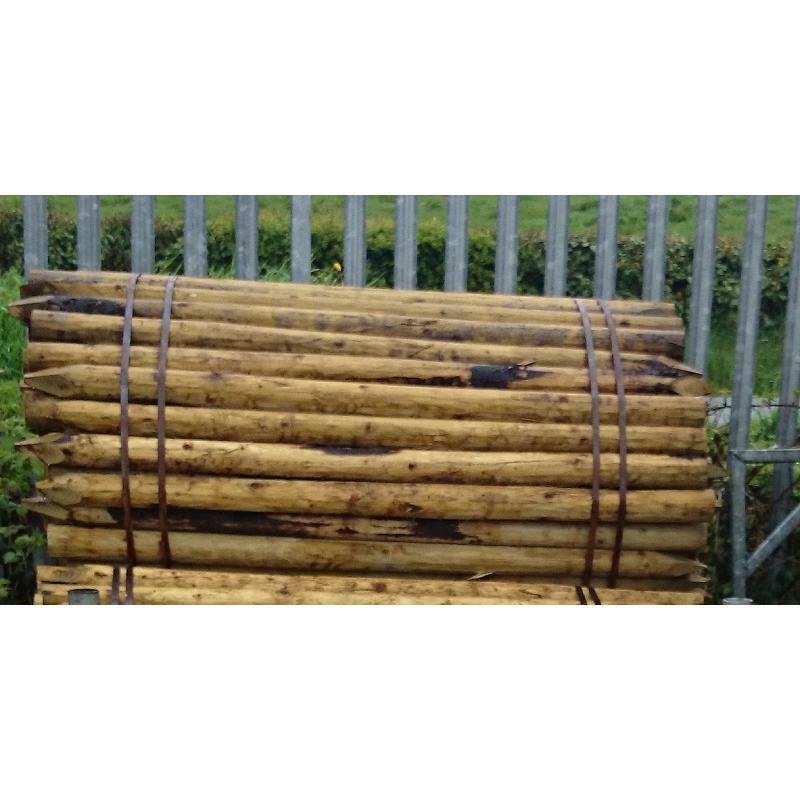 2.4m (8') long 100mm (3″) diameter machine fencing posts. Pointed – ideal for driving and fixing wire up to 6' in height. Pressure treated. 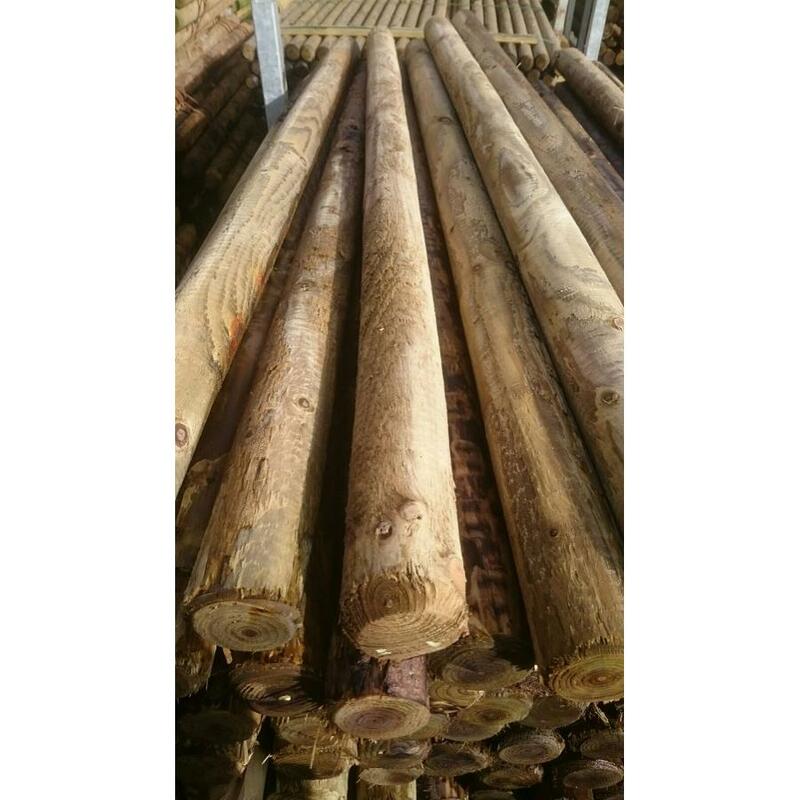 2.4m (8') long 125mm diameter machine fencing posts. Pointed – ideal for driving. Pressure treated. 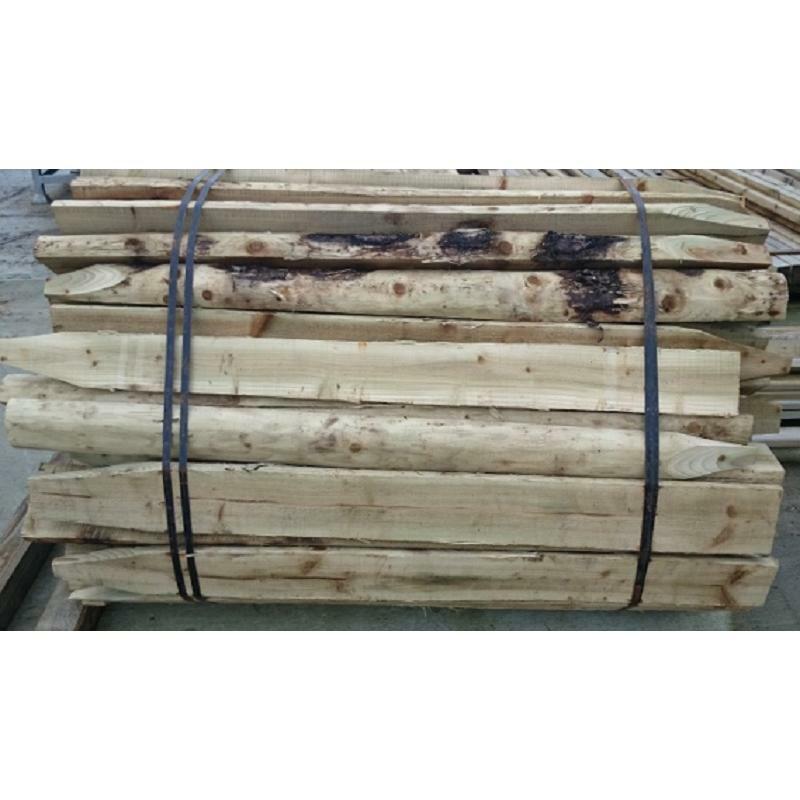 3.0m (10') long 100mm (4″) diameter machine fencing posts. Pointed – ideal for driving and fixing wire up to 8' in height, particularly deer wire. Pressure treated. 1.5m long 80mm machine finished, high quality, long life creosote post with a 25 year warranty. Ideal for all fencing works requiring a high standard of finish and quality.